Denny Jump (Bellevue, WA, United States) on 8 May 2012 in Plant & Nature and Portfolio. An Azalea we planted in our small back area, displayed some really nice colour this year and I caught this on Sunday morning after an overnight rain. Seems edible & so sweet, lovely range of reds & pinks, tender shot ! It's so beautiful, it's worth being seen several days! Wonderful colours and waterdrops! Wish you good and peaceful days. Wow Denny so voluptuous, very beautiful sir. Lush color and the always beautiful droplets to enhance a beauty shot like this one. Beautiful color and I like the droplets! So lovely image. also beautiful colors. Beautiful colors captured in these azaleas! And the rain drops on the petals add that finishing touch! In Future Times, when climate is centrally controlled, I guess all rain will be programmed for 'overnight'. Umbrellas will be fitted with lights. 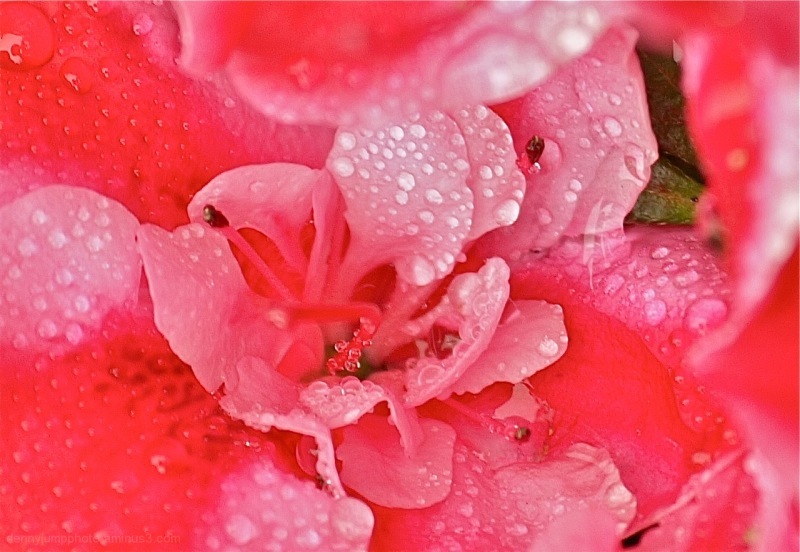 Very nice shot with all of the drops on these azaleas. Gorgeous macro Denny! Love all of those water droplets. Gorgeous capture, Denny. Most people never bother to look this close--thanks for sharing. Fabulous color made so fresh by all those beads of moisture.... delsightful! Luscious color! It looks almost good enough to eat. Cool shot Denny...I like how those beads of water really pop out from the center of your composition. Wow, just wow. This is absolutely gorgeous! Really wow, so beautiful! Gorgeous color Denny! I love the raindrops on the flowers. Beautiful composition!